National Weather Service meteorologist Edward Liske said this season is the first-time Juneau has seen measurable snowfall before Fairbanks since about 1940. 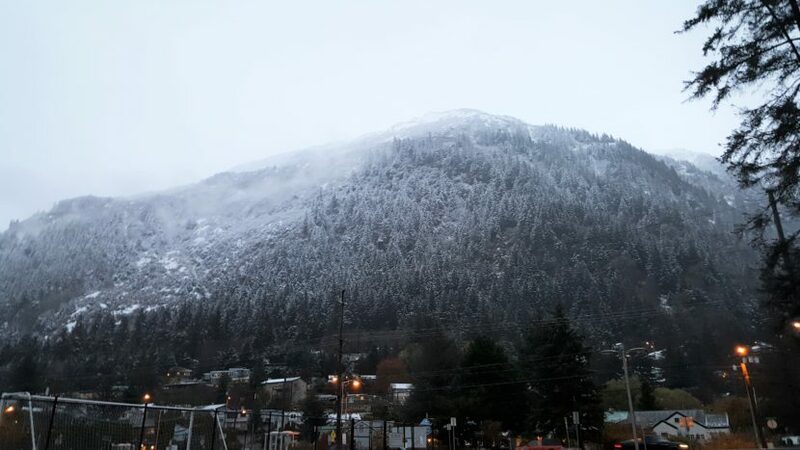 The National Weather Service reported Sunday that Juneau is one of the first communities in the state to see measurable snowfall this year. Liske said Juneau has seen snow earlier in the past. In 1974 and again in 2000, Juneau saw its earliest snowfalls on Oct. 2. This year, Liske said Juneau saw 2 inches of snow in downtown Sunday, 5 inches near the airport and 8-9 inches at the National Weather Service Forecast Office in the Mendenhall Valley. The precipitation started as a sudden mix of rain and snow that hit Juneau on Saturday, interrupting what Liske called unusually warm conditions. “As we started getting heavier and heavier rain, or heavier and heavier (precipitation), it just made the surface temperatures colder and colder to the point that the rain changed over to snow during Saturday evening,” Liske explained. But, he said the snowy weather was short-lived. It was already reverting to rain Sunday evening. He predicted Juneau will continue to see warmer and rainier weather through the rest of the week, and the snow will most likely melt. Before the early snowfall, Liske said an area of high pressure called a ridge surrounded much of Interior Alaska and the Gulf of Alaska giving Juneau uncharacteristically dry October weather. “That ridge has actually been deflecting a lot of our storm systems that we usually see farther south,” Liske said. He said that ridge has mostly collapsed. Liske also said this entire year has been much warmer than usual for Juneau.